Deb's Cup of Tea: One final observation. Heading into the U505 exhibit, reproductions of various newspapers chronicled the timeline of the world inexorable march toward war. I had to photograph this one. 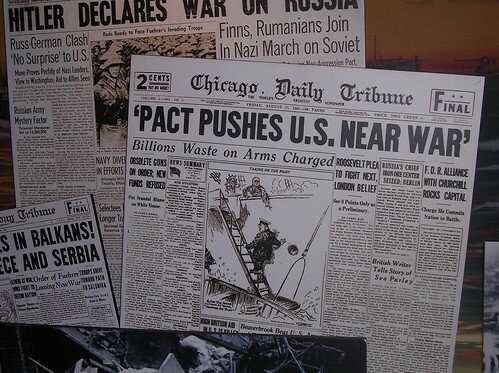 Notice the headline under 'Pact Pushes U.S. Near War'. I stood in front of this display chuckling. I wonder, did Thomas Payne or Ben Franklin or anyone complain in print that George Washington was paying too much for powder? Did Robert the Bruce do an analysis of his costs of providing arrows to his troops? Is the incidence of graft with regards to people supplying goods and services to the Armed Forces a recent occurrence or is this just always the way it was? Og comes into Nog's cave. "Say," Og says to Nog. "You seem to have a nice quantity of meat there and it's good stuff, not the gristly crap handed out at the end of the day." "I'll let you in on a secret," Nog says to Og. "I jacked up the price of rocks I supply to the king. I can afford the good stuff." One particular aphorism springs to mind, but I won't say it. It's too obvious.